The Fullerton Elite is a semi hollow, dual pickup, 22 fret electric guitar, featuring arched top and back, bent sides and a 647mm scale. The Elite also features a thin body profile of only 3.5cm/1.37" making it rest elegantly on your side. Following the established Duesenberg essentials, they use spruce and maple for the Elite's main body parts. The arched spruce top is combined with bent sides and arched back made from flamed maple and is perfected with a deluxe 5-ply cream binding around the body. As with almost any other Duesenberg, the Elite sports a one-piece neck made from American Hardrock Maple which is fitted with a 12" Rosewood fretboard. 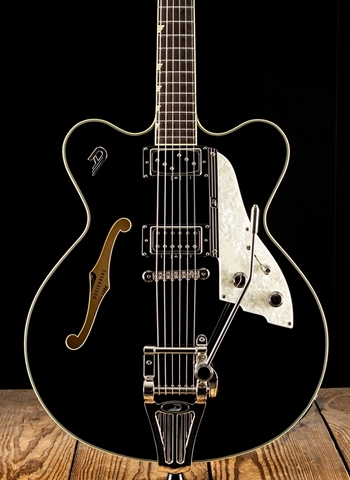 The Elite also shows a unique pickup combination, which opens up a new range of Duesenberg driven tone. For the bridge position, they took their GrandVintage Humbucker, giving you great transparency and warmth right out of the case. This pickup is accompanied by their SingleTwin Domino noiseless singlecoil at the neck, providing you with just the right mix of attack and open tone you would expect from a classic P90 type pickup. All Duesenberg instruments are fitted with their own hardware. They design it with attention to even the smallest details to create truly unique instruments. All Duesenberg fretboards are carefully pleked and finished by hand for optimum playability and the smooth feel they are famous for. Additionally, the Elite is fitted with their Radiator Tremolo, giving you smooth operation and improved tuning stability. Last but not least, they topped it all with some beautiful real pearloid accents with the pickguard and the headstock. The Elite is available in an elegant High-Gloss Black and a stunning metallic Catalina Blue. The headstock on both instruments matches the overall design character of the main body colour. Size: 51,5 x 41 cm / 20.27" x 16"